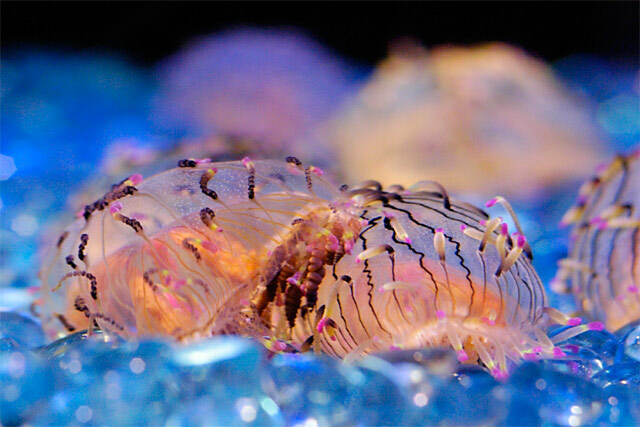 Flower Hat Jellies: Semi-benthic (i.e. sometimes floor-dwelling) jellies that freaked me out a bit coz they looked like "the blob" on each other. Snapped on: June 13, 2004. Nikon D100, Nikkor 50 1:1.8 f3.2 1/40sec. ISO1000, This is the last of my Monterey Ocean Life shots. This week I've been concentrating mostly on film, so I haven't been posting daily photos like normal. Film entails delayed gratification; let's hope they come out good.